We work shoulder-to-shoulder with our charities to make them stronger, delivering better results year after year, to more disadvantaged young people. We help develop charities’ leadership, impact management and sustainability, using our bespoke framework as a guide. 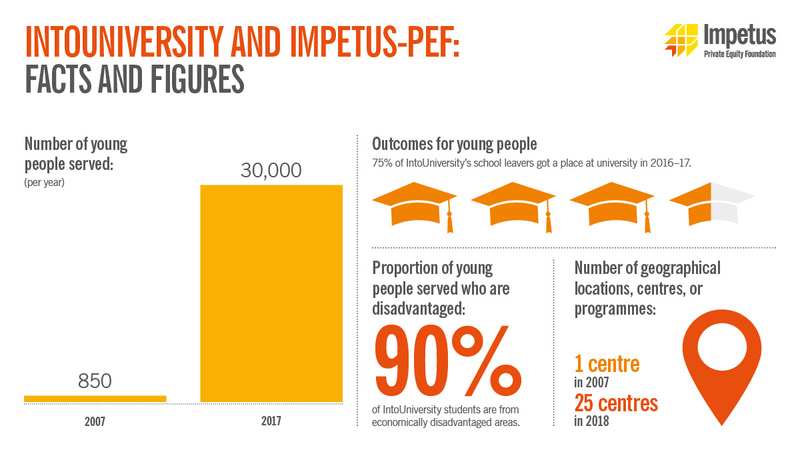 Impetus has helped us become a better run, better led and more sustainable charity. We put the building blocks of impact management in place so that our charities can deliver better results for young people. We support our charities to grow, so that they are able to help more young people succeed. We worked with Big Society Capital to influence government policy on youth employment. This led to the creation of the Life Chances Strategy, and an £80 million fund to help young people who face significant barriers. We founded the Education Endowment Foundation – a charity which aims to break the link between family income and educational attainment – with the Sutton Trust in 2011, in response to Department for Education’s call to build the evidence base for closing the attainment gap. Halve the gap between disadvantaged young people and their better-off peers in getting GCSE or Level 2 English and maths by age 19. Halve the gap between disadvantaged young people and their better-off peers in access to university. Establish and reduce the gap in sustained employment between disadvantaged young people and their better-off peers. Charities do good work, but there’s room for improvement. Our Driving Impact paper shares what we’ve learnt from our charities about impact. This is a guide for funders, commissioners and charities to deliver impactful programmes for young people.